Everywhere these days, people are talking purpose. As big believers, we’re encouraged by all the interest. Yet we’ve observed that many organizations are merely scratching the surface; they’re missing the full power of the kind of purpose that can transform. Many organizations do a superficial job of articulating why they exist, settling for vision-setting exercises that lead to little more than catchy slogans and posters. Some craft purpose statements that are so generic they could apply to just about any company. Other efforts are inauthentic, like the politically correct promotion that has no connection to the company’s DNA. But even among organizations that articulate their purpose effectively, many are guilty of going no further. They do almost nothing to integrate purpose into the day-to-day experiences of their employees and customers. This “surface purpose” amounts to a thin veneer that doesn’t ingrain new beliefs and behaviors. Despite the hype, the organization remains unchanged. Organizations with surface purpose realize none of the benefits of authentic purpose: the energized employees, the stronger organizational alignment, the unswerving customer loyalty, and the greater value that comes from making longer-term investments in people, offerings, and new markets. And they may miss out on a fundamental element of purpose: its positive impact on society. Realizing purpose with the power to transform requires a different approach. From our work with many leaders and organizations over the years, we have developed and honed a methodology for discovering, articulating, activating, and embedding true purpose. In this report, we begin by examining why purpose is attracting so much attention. We then clarify what purpose is. Finally, we present the four steps that organizations should follow to bring purpose to life—to realize the kind of purpose that will anchor and guide them through challenging circumstances and changing times. Why All the Buzz Now? To suggest that companies have historically lacked purpose would be disingenuous. Purpose is elemental to humans and human institutions; it’s an existential imperative. We have one life, and most of us spend most of our waking hours working in an organization. It’s important that we find meaning and fulfillment in what we do. We put this to the test with our own analysis. We surveyed the leaders, employees, and customers of 50 companies in three major sectors: technology, media, and telecommunications; consumer products; and financial services. We analyzed the results from multiple angles, using measures such as total shareholder return (TSR), revenue, and EBITDA growth. 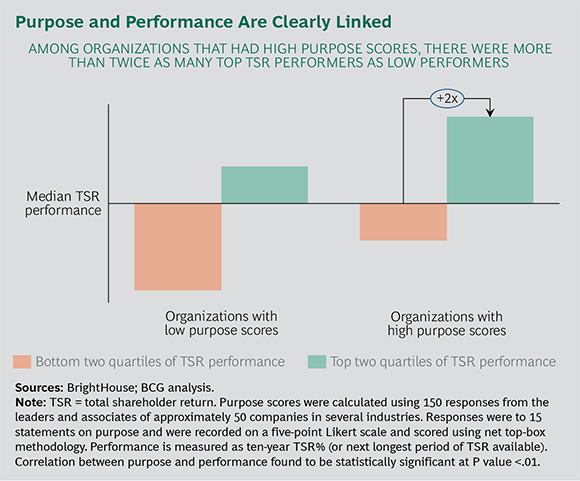 Our finding: purpose (when it’s truly ingrained) correlates strongly with ten-year TSR. (See the exhibit.) So, purpose does indeed pay—and it does so over the long term. Leaders’ Rising Aspirations, Employees’ Shifting Priorities. In recent years, more and more leaders have declared their commitment to deliver on the triple bottom line—people, planet, and profit. Attracting, engaging, and inspiring employees, along with demonstrating responsibility to the community and committing to sustainable environmental practices, have become as important as generating profits. In addition, leaders are increasingly feeling a personal need to have a positive impact and legacy. They see business playing a larger role in shaping society. Similarly, growing numbers of employees are seeking more from their work. Finding meaning in one’s job and being part of an inclusive community have become more important, especially to millennials. These goals have also become more important as digital technologies proliferate and the opportunity for face-to-face interactions with colleagues and customers diminishes. People want to work for an organization that values social and environmental responsibility—that strives to make the world a better place, not just to make more money. Amid overlapping transformations, purpose becomes even more important—providing much-needed alignment, clarity, guidance, and energy. That energy acts as fuel to a transformation by providing an emotional connection that inspires greater commitment. Purpose serves as that vital North Star, illuminating a direction and linking and steering various transformation efforts in a way that is logical and accessible to everyone. Consider a European home products conglomerate that recently launched a growth transformation that involves geographic and channel expansion and an M&A agenda. Purpose has not only helped management and the board align on the company’s future; it has also served as a go/no go decision guidepost on matters as wide-ranging as product lineup, market focus, channel choices, and M&A targets. The Limits of Carrots and Sticks. The shift in employees’ expectations, together with the demands of always-on transformation, has further exposed the shortcomings of attempting to influence people through carrots and sticks. In far too many transformation programs, people are treated as a means to an end or, worse, as collateral damage. To counter this tendency, organizations are realizing the need to appeal to head and heart with intrinsic, not just extrinsic, motivators. Extrinsic motivators focus on individuals’ desire to be rewarded (rather than punished) and to have their contributions recognized by leaders and peers. Intrinsic motivators include employees’ desire for meaning, connection, and joy in their work, as well as the desire to contribute, develop, and achieve. (See Exhibit 1.) Purpose is one of the most powerful intrinsic motivators because it speaks to both the head (as the compass that guides and aligns behaviors) and the heart. A “Digital Everywhere” Business Environment. Although many traditional forms of community have eroded, people still crave the sense of connection that it provides. Digital technologies link people in multiple ways, giving employees and customers alike greater access to an organization. But without in-person interaction, the bond can seem insubstantial. Purpose enables digital interactions to be more meaningful by imbuing them with a sense of the shared values that create communities. Purpose also facilitates digital transformation. Unlike transformation initiatives that can be launched and driven from the top by a program management office, digital transformation tends to be a bottom-up phenomenon involving many people across the product offering and the company’s value chain. Purpose helps guide and motivate those distributed efforts by engaging people from the shop floor to the top floor—as well as external stakeholders. Consider how a European consumer goods company drew on purpose as part of its digital transformation initiative. The company launched a global social media campaign to connect customers with the company’s historical commitment to scientific innovation. The company went on to publicly support global science education initiatives, demonstrating that its commitment to science goes beyond its products. Before we explore how companies can instill true and effective purpose, we need to flesh out our definition. In answering the first question, purpose captures what is true about the organization at its best. Purpose is also aspirational: it depicts what the organization can be and goes beyond brand positioning to take a stand. Rather than being only market driven, a purpose-based organization is also driven by values, culture, and ethos. In addressing the second question, purpose reframes an organization’s compact with the world; instead of being an obligation, social responsibility is seen as an opportunity. A purpose-based organization would assert that if it disappeared tomorrow, the world would lose something meaningful. Rather than employees, a purpose-based company has missionaries. Instead of customers, it has advocates. In place of social charity, it avows social conscience. Instead of loyalty, it aims for love. Presence. Is the organization’s purpose clear, compelling, and noticeable to customers and employees? Do they understand it enough to describe it, beyond what the company makes or sells? Strength. Is the organization’s purpose inspiring? Does it reflect a real need in society? Is it a rallying cry? Could it be as relevant tomorrow as it is today? Does it suggest that the organization is resilient in the face of an unknown future? Alignment. Does the purpose reflect the company’s roots, history, and DNA? Do leaders believe in it? Does it motivate them to take certain actions? Do leaders feel that being part of the company is being part of a movement? Integration. Are the company’s decisions in harmony with its purpose? Does the company live its purpose with passion? Would leaders turn down a profitable opportunity or disengage from a business activity if it wasn’t tied to the purpose? Advocacy. Does purpose elicit greater loyalty from employees and customers? Are people more engaged with the company because of it? Would employees and customers recommend the company to others because of its purpose? Now let’s turn to our final, critical question: How do organizations bring purpose to life—ingraining purpose with the power to transform? In the price-transparent, instant-click-and-buy internet era, being a brick-and-mortar retailer has become ever more challenging. A leading national clothing chain was starting to feel the squeeze from brick-and-mortar as well as online rivals.1 To drive growth, the company needed to do more to showcase what made it distinctive. As a first step, the company probed why customers chose to shop at its stores—not just the rational reasons but also the experiential and emotional ones. Surveys and focus groups uncovered insights from several thousand customers in key markets where competitors had encroached substantially. Because personal attention was the store’s hallmark, leaders understood the importance of engaging with employees on a deeper level. Focus groups helped unearth employees’ motivations and needs, such as the desire to work for an organization that played a special role in the milestones of customers’ lives. For inspiration, leaders revisited the company’s founding purpose: enabling men and women to “dress to their dreams.” By helping people express themselves and to look and feel their best, they can become their best. The company also brought in two experts—a psychologist and a theater director—to shed light on the role of empathy and the importance of appreciating major life milestones when dealing with retail customers. To ensure authenticity in the purpose statement, leaders studied the story of the company’s founder, a single mother who when returning to the workplace wanted her appearance to reflect her aspirations—without ruining the family finances. Leaders also examined the core strengths they could tap into more deeply. For example, sales associates had a reputation for being caring shopping “advocates,” adept at guiding insecure or overwhelmed shoppers toward successful purchases. And throughout the branches were hundreds of middle managers, single parents themselves, who could relate to the founder’s story. Local “purpose ambassadors” helped activate purpose among the frontline employees. Executives condensed store policies from a rule book to a single page of guiding principles. This allowed employees to use their judgment in creating positive experiences for customers. Together, these efforts gave managers as well as employees the freedom to find new ways to sell and to solve problems on the spot, entrusting them with ownership of the customer relationship. New performance management and recognition programs were instituted at 15 pilot sites. The company put in place peer-to-peer recognition and feedback programs to celebrate employee acts that represented meaningful experiences for colleagues or customers—such as the employee who helped a shopper assemble a gift of new ties for her grandson’s first job after college. Performance-based financial incentives helped reinforce success; if a store created a winning promotion tied to purpose—say, helping customers “nail the job interview” with a well-chosen outfit—sales associates would receive a bonus. The company trained store managers on delivering purpose-related messages, knowing they would be more credible and more powerful than any generic communiqué from headquarters could ever be. Doing so also reinforced the notion that purpose comes from within. The results are telling. In one year, pilot stores’ employee engagement scores improved twice as much as those of the stores with the next best engagement improvement. Greater engagement levels translated into better customer interactions, which showed some of the highest improvements in the company’s history. Sales in the pilot locations, which were stores that had been lagging, rose 10% over same-store sales in a two-year period. And market share was up 2%—an impressive accomplishment at a time when other chains were being forced to shutter locations. 1. Based on an actual client; details have been changed to ensure confidentiality. Discover. How does an organization identify its purpose? It starts by digging deep to unearth employees’ sentiments and consumers’ insights. In this phase, the organization immerses itself in materials related to the company’s culture and ethos. Through employee workshops and surveys, customer surveys, focus groups, and one-on-one interviews (of people from the C-suite to the front line), the company probes such questions as, What do we aspire to be and do? What would the world lose if we were gone tomorrow? Articulate. In this step, the organization develops and communicates its purpose statement. It crafts a story in its own voice that resonates with employees and customers. Creative messaging and emotionally powerful communications are crucial for articulating purpose effectively. A two- to three-minute film can serve as a visual illustration, in which imagery, music, and text engage head and heart. Film is particularly effective for disseminating purpose to a dispersed workforce because it does the talking for leaders and ensures a consistent message throughout the organization. For North America’s largest building materials company (the division of a global company), film has been an effective tool for communicating purpose. The division, which had grown chiefly through acquisitions, urgently needed to foster cohesion in order to manage and leverage scale, drive growth, and succeed in the long term. After articulating its purpose, the company commissioned a film on the theme of the human impulse to build. To engage the division’s tough, independent-minded people, the film featured only real employees doing real work, wearing their hard hats, safety vests, and steel-toed boots with pride. The film (as well as key rollout communications) recounted the company’s early-20th-century roots—two entrepreneurial European brothers who began with a single truck and a sand pit—a story that would resonate with those who became employees in North America through the acquisition of smaller, often family-founded, businesses. Activate. Once purpose is articulated, it’s time to roll it out: to enlist leaders at all levels to take symbolic actions that demonstrate it and to embody it in their words and deeds. Activating purpose requires employee-facing as well as customer-facing initiatives. The most effective initiatives link emotional triggers (how the organization makes customers or employees feel) with experiences. Leaders need to become personally invested in the organization’s purpose, offering support for and ideas on disseminating it throughout the enterprise. Walking the talk is crucial: if the company’s purpose calls for collaboration, leaders should demonstrate it by, for example, openly sharing information across businesses or encouraging their reports to shadow a cross-functional colleague for the day. Leaders need to be willing to correct those exhibiting behavior that conflicts with or undermines purpose. The building materials company began activating its purpose by sharing its film with its top 200 leaders. To rally leaders located outside of headquarters, the company organized a purpose “road show” to screen the film at four locations; all levels of leadership across the country were invited. For the headquarters screening, the company rented a theater and sent out invitations with tickets, treating the event like a movie premiere—right down to the green (not red) carpet, to match the company’s color. Employees who appeared in the film got star treatment. As a symbolic gesture, executives gave employees “optimism building blocks” with the inscription, “What did you build with optimism today?” (a reference to a line from the company’s purpose statement, which reads, “Optimism is the strongest building material on Earth”). From there, the company went on to create online leadership toolkits, teaching films, and other materials critical to turning articulation into action. Purpose always matters. But in this era of heightened aspirations for leaders, shifting employee priorities, and always-on transformation, purpose has become even more important to both guide and energize organizations. It’s powerful in smoothing digital transformation, wooing and motivating talent, and elevating employee engagement to propel a thriving organization to new heights. And purpose can help an organization emerge from crisis or help heal its ailing culture. Purpose can be powerful, but only if it’s authentic and deeply embedded. Go beyond surface purpose. Take the time to discover and articulate your purpose. But don’t stop there. Enlist leaders and advocates throughout the organization to find enduring ways to activate and embed it. Then, and only then, will you have purpose with the power to transform.